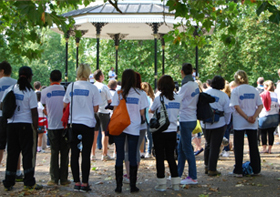 The Mouth Cancer Foundation holds its annual free sponsored Mouth Cancer 10km Awareness Walk in September every year in London's Hyde Park. The event raises much needed funds and awareness to combat all head and neck cancers and people travel from all over the country to take part. The walk aims to raise the awareness of the symptoms of mouth cancer. The Mouth Cancer 10KM Awareness Walks over the past seven years have been hugely successful. See photos here! It is hoped that this year's event will prove to be even more popular and that the crowd will attract the attention of the media to help raise awareness of mouth cancer. If you wish to participate in the walk then please register online so that we can send you further information in time for the event. Everyone of any age and ability is invited. On the day participants will receive a participant bib, t-shirt and refreshments for the walk as well as a goodie bag with lots of freebies given out at the end of the event. There are also prizes for the best dressed individuals and teams and those who make the most effort to raise awareness for mouth cancer.